Marketing and SEO Services by a Bail Bondsman and Bounty Hunter! How to Outrank Your Competitors! There are many considerations that must be carefully weighed before making the decision as to whether or not the time is right for you yourself to either start a small business or to expand an existing small business; indeed, running a successful small business is part timing, part luck, part science, part intuition, part having startup capital, and all experience in that specific area or related areas that will be undertaken—now multiply the aforementioned points by a factor of 10 in terms of engaging your area of operation as a bail bonds company owner. Today a bail bond company owner must have a working knowledge above and beyond the art of running a small business to include learning new laws and regulations, department of insurance licensing, advertising, website design, search engine optimization, effectively using social media, being prepared to routinely draft, appear, and argue with trained attorneys in open court, and maybe even track down wanted misdemeanor and felony bail jumpers or at least know how to hire low liability bounty hunters to do it for you—bail bonds isn’t for everyone but some are raking in the cash to be sure. The good news is that with proper guidance and education, you can follow hundreds of people who have taken advantage of the many services Bailspeak offers to realize their dreams of working in the bail bonds industry. Static websites are considered less than advantageous when compared to websites with bail videos; indeed, visit your competitor's websites and you may find that a growing number have installed videos on their websites. A rising percentage of video viewers click to learn more about the product or service, and viewing videos on a website goes to showing the personality of the business or its owners, which may result in an increase in inbound calls. The more a potential client can gather from a quick visit to your website, the longer a person will stay on your website. The video to your right is an example of effective "Branding" and use of a marketing device perfectly suited for Social Media. The atypical brochure styled websites or overly laden websites that are too complicated or take too much time to load by desktops, laptops, tablets, and cellular phones, while each somewhat industry standards, are exactly what should be avoided. Your prospective clients move quickly, and, generally speaking, your media should move quickly too and offer something that can be seen and heard and replayed. Bailspeak offers a well hidden production department that is run by people who have been successful in all areas of the bail bonds industry. This in and of itself should carry great weight and be deemed controlling over hiring someone who is tech wizard but knows little to nothing about bail and bounty hunting. 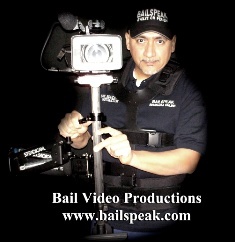 The video to your right is a lengthy version of a bail bond commercial (proposed, written, produced, edited and up on YouTube within 36-Hours) presented herein as an example of Bailspeak’s work in Internet Video Productions. The process to get your Internet Bail Videos up and running is simple in theory but requires logistical coordination and, most of all, a budget. Stated differently, Bailspeak cannot provide a precise quote with a simple phone call; that would be like demanding a home building contractor to provide an exact cost to build a custom home with no other information. Nevertheless, you should feel free to call and discuss what your idea is, and rest assured, that all preliminary and ongoing information is treated confidentially. Take some time and visit the websites of your bail bond and bounty hunting competitors, and, if they’re doing something to rank higher or draw in more visitors that you are not, you may want to seriously consider going forward with simple to more complex video productions that go to promoting your business. 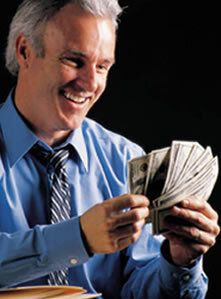 All too often, this Office receives calls from bail bond company owners who spent noteworthy amounts of cash hiring so-called organic SEO people and companies who have absolutely no background in the bail bonds industry; therefore, it stands to reason that results from sales and marketing vary. Bailspeak is run by people who have succeeded and continue to succeed in the bail bonds and bounty hunting trades and with a long track record of helping others get into bail in general. Learn How Rex Venator’s Bounty Hunting Students have used his Nationally Proven Sales and Marketing Techniques to Win Lucrative Bounty Hunting Jobs from Bail Bondsmen, Bail Bond Companies, Bail Corporations, and Insurance Sureties. How to find bounty hunting jobs is one of the most oft asked questions by people who speak to Bailspeak's Live Seminar Instructor, Rex Venator. Now, you can learn what Rex has taught his Seminar and Street Trained Bounty Hunting Alumni who have taken the lessons and become successful bounty hunters! Hundreds have been street and/or seminar trained by Bailspeak's Rex Venator, and now, for the first time, comes the next evolution in Bailspeak's absolute cutting-edge bail bonds education and bounty hunter training.